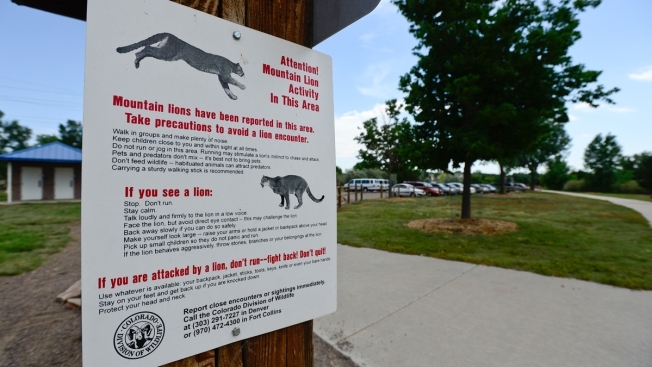 In this file photo, a sign warning Golden Ponds Park and Nature Area visitors about mountain lions is seen on Monday, June 17, 2013, on a park map kiosk. A mountain lion lunged at a runner on a Colorado trail and bit his face before the man fought back and choked the animal to death, wildlife officials said Tuesday. The unidentified man was running alone at Horsetooth Mountain Open Space near Fort Collins on Monday when he heard a noise and turned back. That's when the mountain lion attacked, according to an account from Colorado Parks and Wildlife. The agency said the runner's movement apparently triggered the young lion's hunting instincts. The animal bit the man's face and wrist before he was able to break free and kill the lion. Authorities are not identifying the man and say he needs time to decompress and decide if he will speak out. The man told investigators he choked the lion, and an examination of the animal confirmed that, said Rebecca Ferrell, a spokeswoman for Colorado Parks and Wildlife. Ferrell said the runner did exactly what experts recommend in a rare encounter with a mountain lion — fight back as hard as possible. They also advise trying to get back up on your feet if knocked over, look as big as possible and use anything handy as a weapon, such as a backpack or keys. But the man who was attacked did not have any gear to help him. Mountain lions rarely attack because they tend to avoid people. The animals have killed fewer than 20 people in North America in more than 100 years. In Colorado, where their population is strong, mountain lions have injured 16 people and killed three since 1990.